I would just like to say that I purchased a pair of autosocks for my Skoda Fabia in anticipation of the winter to come. Low and behold, today was the day of reckoning! I found myself caught in unexpected snow fall which left the roads barely passable even with 4x4's. I was actually on a steep hill amongst other failing traffic. I lost all traction and decided to fit the 'socks. Fitting was as easy as described and demonstrated by yourselves, so far so good. I proceeded to pull off, no wheel spin just forward movement. I drove for a further 7 miles home in bad conditions in and out of struggling vehicles whose drivers must think Skoda's are the winter car. Whilst stopped, some curious looks were thrown towards my front wheels. I have been driving for over 30 years and can honestly say they are the best motoring purchase I have made. I would recommend them to anyone as an emergency get you home aid, and in my opinion, they should be made compulsory carrying during the winter months. Please forward this mail to whoever you see fit. "Had to go to the butchers for the Christmas turkey. It's down a country lane, so I put on the AutoSocks. Fantastic! No slipping at all, even when going from 0-30mph in a straight line, thanks." 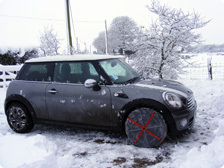 "Just got home in 4 -5 inches of snow, passing several stuck 4x4\'s (wondering why low profile road tyres were spinning! ), even managed a steep hill, all be it on a second attempt. What car? A 10 year old Ford Focus. Thank you so much!" "Steep hill 50 yards from home. No chance on rubber - autosock made it just like I was on a dry road. 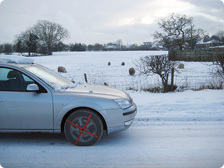 Thank you"
"I am very impressed with my autosocks used them for the first time on Friday morning easy to fit and remove a lot better than snow chains." "A few months ago, in anticipation of winter, I purchased some Autosocks for my BMW 320 Estate knowing how difficult it would be in snow with her. How right I was - attempted to get to work and found myself loosing traction in 6" of snow (at least) with my car going nowhere. I managed to get the Autosocks on in a matter of minutes literally, which greatly surprised me. Once they were on, I turned the car around and away I went and they got me home with no further problems. So I just felt I had to email you and thank you for such a wonderful product, they have been worth every penny in just one day! and so easy to get on and off which helped as I have quite slim forearms for getting inbetween the wheel arch and the wheel for fitting. I wish I could tell everyone to buy these." "Arriving in Austria last week in falling snow with packed snow and ice on the roads the final approach to our destination was a 1 in 4 uphill gradient. This finally defeated the Volvo's winter gear setting, traction control and winter tyres. The Autosocks were extremely easy to fit and we continued from a standing start on the hill without any difficulty. A very impressive product. I will not be traveling anywhere in winter, home or abroad, without them from now on"
"I used mine on Friday, they gave me much more grip, allowed me to take the back roads and get away from the cars who refused to move as they had no snow socks or chains or anything!" "I used my autosocks today in anger. They are great! I passed abandoned cars and trucks with no problems! During my journey of 26 miles I drove on non-gritted roads and up very steep hills covered in snow. Thank you!" "I've had my AutoSocks a week now and they’ve got me out of trouble 3 times. I live in Nth Northumberland and work in Aberdeen, travelling weekly. 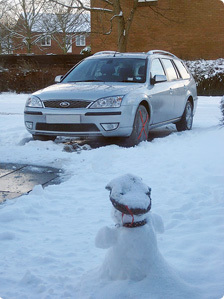 Last week’s snow in Edinburgh stranded many motorists overnight, but my AutoSocks got me through without any problem. Last night and this morning, Aberdeen was almost gridlocked, but once again my Auto Socks got me through. Thanks." "We carried on, while others were stuck - well worth the investment!" "I bought mine ages ago in preparation a year ago for snow we never had! Had to get them dirty today for the first time! To be fair, well impressed - got me moving again up a hill and on to the motorway. MG ZR with wide tyres has never been particularly good in snow, these worked a treat. In fact just ordered another set for the wife for her car as they have proved to me that they work. Thanks!" "I live in a very remote location and both my car and van would not climb the snow and ice covered track.....until I fitted snow socks! Totally brilliant thank you"
"Got me up the hill to get home ,passed 3 sliding cars, 2 vans and a stuck coach. Neighbour impressed and wants to buy some." "Have just put mine on. Feel safe again! Couldn't do without, everyone should have a pair." "Really impressed, worked a treat. Meant I was the only one in the work carpark. Got me out of my hilly sidestreet easily. Passing stuck drivers all over the place." "Ordered mine late one afternoon and they arrived first thing next morning so great delivery service to start with! have used them twice so far,first time t drive the 4 miles to work ( I live in the back end of nowhere) and again today whilst parked on a slope of sheer ice,popped the socks on and off I went. I would say to anyone reading this who doesn't have auto socks, get them!" "Used mine for 3rd year running over last two days. Got my fully laden VW Caddy Van up an snow & ice packed 10% hill this morning, as if there was no hill there !! Everyone else left cars at the bottom. Well worth it"
"We live on the side of a hill in the Cotswolds and my husband has a transit van. He got to work and back no trouble and the neighbours are all impressed with his autosocks." "Used mine today on my 38 year old VW camper. I was chugging past all the modern cars with no problem Really great grip!"